Yews are a popular evergreen shrub that can be found around many homes. They have bushy, dark green needles and do most of their growing in the spring and early summer. Without proper trimming, they can look unkempt in short order due to their fast growth. If a yew shrub gets severely overgrown, it can be cut back with a severe pruning; however, it will take a few years for the yew to recover and look great again. Give your yew shrub a general shearing with your hedge trimmers to clean it up in the early spring. New buds will form on the old wood and will flush out in the late spring. Allow new growth to flush out and finish growing. New growth will finish by early summer. Prune the yew shrub in early summer to maintain its shape. Use a hedge trimmers for thin growth and a pruning shears for thicker branches. The best shape for a yew shrub is to taper from small to large as it goes from top to bottom. This will allow light to reach the lower branches of the shrub effectively. Prune off all dead or dying branches with your pruning shears. Cut the dead growth as close to the living growth as possible. You can identify dead or dying growth by looking for brown or yellow needles. 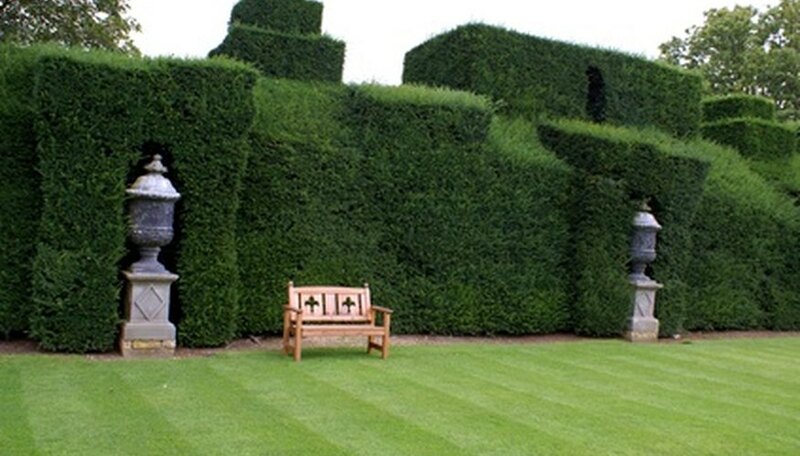 Maintain the yew's shape throughout the rest of summer with your hedge trimmers. You shouldn't be cutting much off at this time--just keep excessive late-season growth in check. If the light pruning hasn't produced adequate results, you'll have to wait until the following spring to do a severe pruning. The yew shrub contains new buds which are hidden under the bark. You can cut up to 1/2 to 3/4 of the yew shrub back and it will grow back from its hidden buds. It may take a few years to fully recover and look lush again, but this is a good alternative when you have a severely overgrown bush. If you cut back your yew shrub severely, provide ample water the first year. An inch of water per week over the root system should be adequate for the new, tender growth. Trim your yew shrub yearly to prevent it from becoming overgrown. Wear gloves when cutting and handling yew branches. They can have sharp ends which can cause severe cuts on exposed skin.